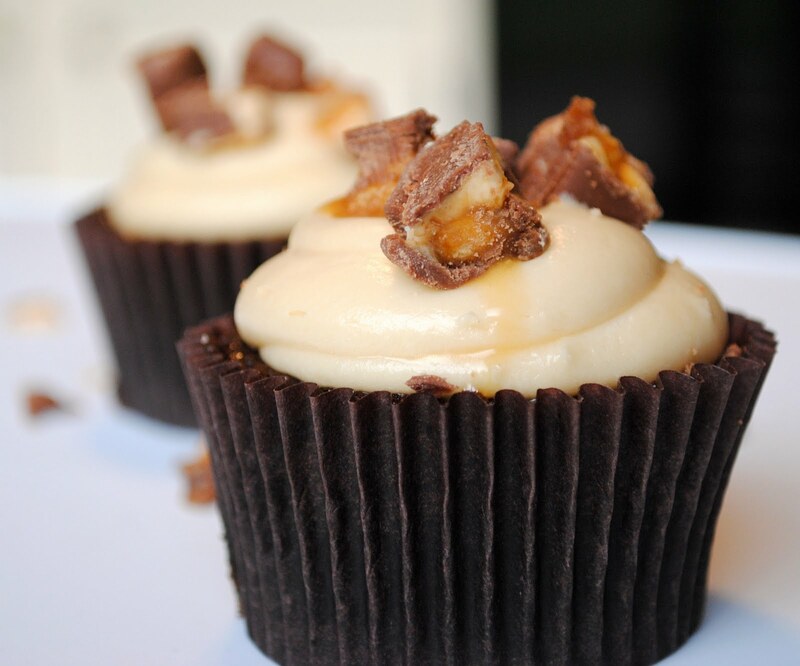 While walking through the candy aisle at the grocery store the other day, I got an idea to make Snickers cupcakes. I picked up some mini candy bars as well as caramels and caramel sauce. I knew I wanted to do a chocolate cupcake base with a caramel filling but wasn't sure if I wanted to use a caramel candy or caramel sauce for the filling. For frosting, I went with a caramel buttercream and then topped the cupcakes with chopped Snickers pieces for garnish. For the cake, I used my go-to chocolate cake recipe - the Hershey's Perfectly Chocolate Cake recipe. I love this recipe because it mixes up extremely fast and always turns out a rich, moist cake. To experiment with the caramel filling, first I baked the cupcakes and added a caramel candy to the center for the last three minutes of baking time. I wasn't a fan of these though because although the caramel softens in the oven, it quickly hardens back up and makes a very difficult to eat, hard center to the cupcakes. On to plan B, the caramel sauce. I hollowed out a cone shape in the center of the cupcake using a paring knife and filled them with a little caramel sauce. I much preferred this method for the caramel filling. You can make your own caramel sauce or just buy the caramel sauce found in the grocery store, like ice cream topping. Preheat oven to 350 degrees and line pans with cupcake liners. Recipe yields about 30 cupcakes. Combine sugar through salt in a large bowl. Add eggs, milk, oil and vanilla and beat on low until just incorporated. Increase speed to medium and beat two minutes. Stir in boiling water, the batter will be thin. Transfer batter to prepared pans, filling each liner about 2/3 of the way full, approximately 1/4 cup of batter. Bake approximately 22 minutes, until a toothpick inserted in the center comes out clean. Cool in pans about five minutes and transfer to a wire rack to cool completely. When cool, use a paring knife to cut a small cone shape out of the top of each cupcake. Add caramel sauce as desired. You can cut the point off the cone and add it back to the cupcake if desired. Beat butter on medium speed until smooth and creamy, about two minutes. Add caramel sauce, heavy cream and vanilla and mix to incorporate. Add powdered sugar, one cup at a time, beating on low speed until incorporated to reach the right consistency. Increase speed to medium-high and whip about one minute until light and fluffy. Fill a piping bag and pipe onto cupcakes or frost as desired. Coarsely chop candy bars and sprinkle over the top of cupcakes. I saw a very similar recipe over at My Baking Addiction recently that sounded so sinfully delicious. 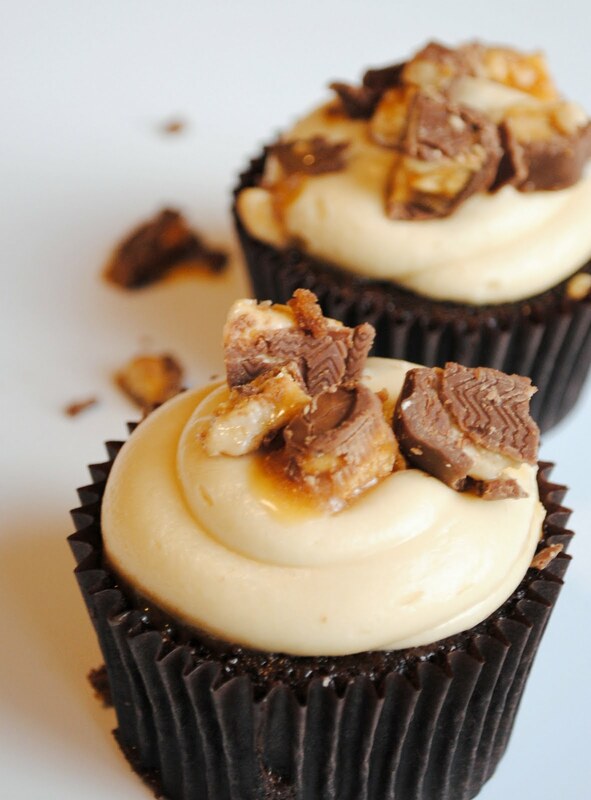 My Baking Addiction placed a miniature Snickers into the center of her chocolate cupcake before baking, but I really like your idea of filling the baked cupcake with caramel sauce instead. I'm definitely going to have to give these a try soon. I think I'll make some homemade caramel sauce for the filling and frosting. MmmMmmmMmmmm!! *:)* And your pictures are gorgeous! do you add the cone back into the hole you cut out or leave it out and fill in with buttercream? I know you said it was optional, but I was wondering what you prefer. @Jen - it depends on the cupcake and the filling for me. With these I added it back in since the filling isn't real thick. I don't cut the cone very deep so there isn't really much to fill with buttercream even if I left it out. If you add too much caramel to the middle, these would be really messy. Whats your opinion on cutting recipes in half, particularly when baking? @Ashley - I cut recipes in half or even thirds depending on the recipe quite often, especially if I'm just baking to bake. I try to make sure I dont ever have to use 1/2 an egg or something like that because you can upset the balance of a recipe when you get to that point but it can still be done if you are careful. If recipes call for half an egg, you should crack one egg into a bowl and whisk it up with a fork...divide that mixture in half and that way you wont "upset" the recipe, as you put it. I just made these for a party and one of my girlfriends proclaimed it "the best cupcake she has ever eaten"! Thanks so much for the recipe! @Lizzie - so glad they turned out well for you - thank you! I'm actually not sure what the jar says without looking at it but its a Hershey's brand in a glass jar. Hope that helps! How many cupcakes does this recipie make? I might just be missing it. Thanks! Jen...at what point do you add the baking powder/soda and cocoa powder? I think I got confused on that step! I just made these they are terrific I chose to place a half of a funsize snicker in center instead of the caramel sauce. These are very rich but so delicious. Thanks for you blog. so you mix the first 6 ingredients in the 1 cup of boiling water? and the following 4 ingredients too ? @Jamie - no sorry - I just corrected the typo above that said "combine in a large boil" - it should have read bowl. You mix the first 6 ingredients in a mixing bowl, then add the eggs and such, mix again. Then finally mix in the boiling water. Sorry for the confusion that my poor proof-reading caused. 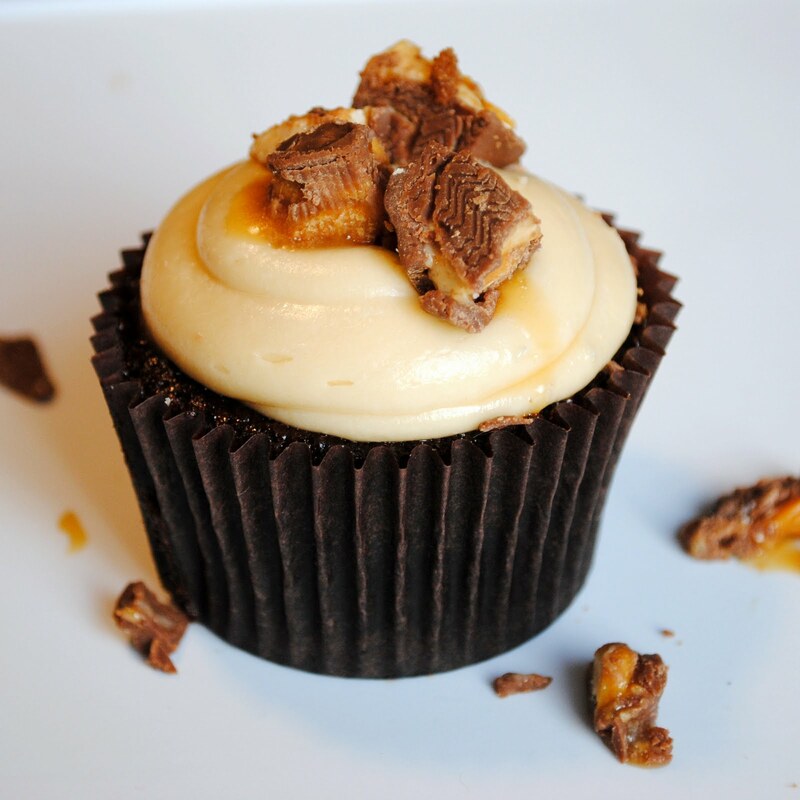 Can i make the cupcake ahead of time (freeze) and add the caramel filling and frosting day of my event? @Ashley - I've never tried it, but I don't see why not. Do you Use regular cocoa Powder (milk chocolate) or special dark by Hershey's? If neither which brand/what kind do you use? I use regular Hershey's milk chocolate cocoa powder in these. These would be good if you put a caramel filled hershey kiss in the center of the cupcake before baking! Made these for my family and friends, they raved about them,said they were amazing!They were soooo good.Not hard to make and had fun too. what do we do with the flour and baking powder and other stuff? do we mix that in as well? @Sophia - all the dry ingredients get added together - sugar through salt in the ingredient list above. Sorry for the confusion. when do you add flour? all the dry ingredients get added together - sugar through salt in the ingredient list above. Sorry for the confusion. I made these yesterday for my niece's high school cheer team for their competition. They were a huge hit. The adults loved them as well. Followed your directions to the letter and everything was perfect. Thank you for sharing. Just made these last night for my hubby for his birthday. He is obsessed with Snickers candy. These cupcakes were amazing! Everyone loved them. The cake was so moist and delicious and the frosting was perfect! Thank you for sharing this recipe! Will definitely be doing these again. Hi Jen, just to reconfirm! In your recipe all the ingredients are measured in cups. Are you referring to the normal measuring cups? Will they differ in sizes? Yes I'm using standard measuring cups. They will differ in size if you use a coffee mug or something like that. I measure all dry ingredients in standard dry measuring cups and use Pyrex liquid measuring cups for wet ingredients. These were so yummy, I made them for my cousins graduation and they were a hit. The recipe for the cake and icing were amazing, I didn't have any problems with the recipe I just followed the directions and read the note on sifting the dry ingredients first. They were delicious. Thanks for posting the recipe. I loved the chocolate cake.It was moist and delicious.But the frosting was WAAAAY to sweet.I love sweet things but it was overly sweet.I had to change it to a chocolate butter cream which was better. Can I make these a day ahead of event and refrigerate overnight? Will they be "as good as new" the next day? :) Thanks! They will be fine overnight... you don't need to refrigerate as long as it's cool in your house - just keep them in an airtight container. Hi Jen! 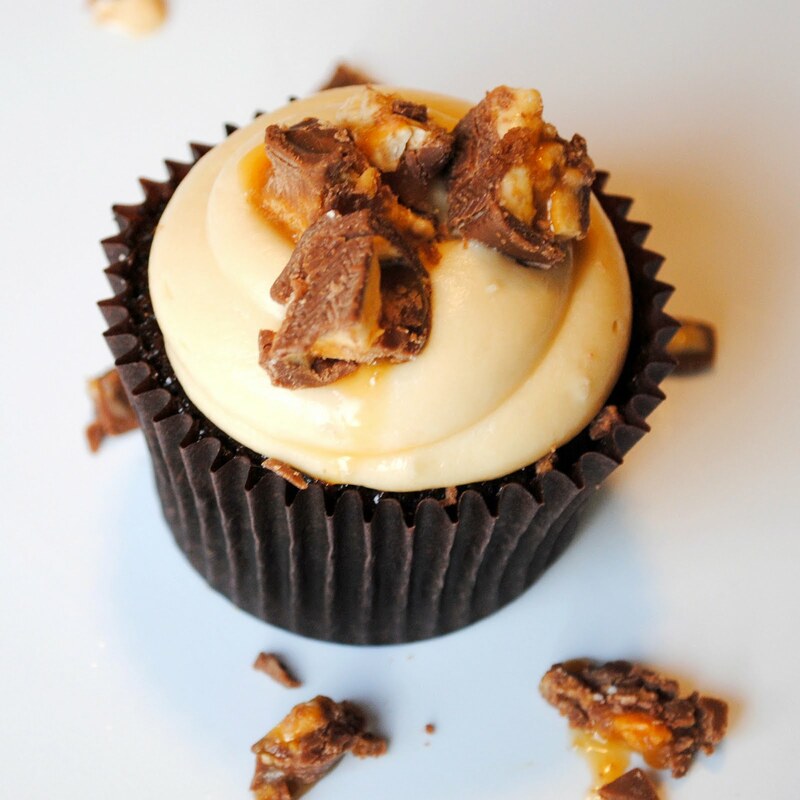 I love Snickers and couldn't help but feature your cupcake recipe on my recently started blog about cupcakes. Keep up the great work! Made these yesterday. Boy were they yummy!!! Thanks for the recipe. What kind of tip did you use to frost them? They look lovely. The tip I used on these is a large round tip... I believe it's Ateco brand but I ordered it from Bake It Pretty a long time ago. It doesn't have a number on it but it's the biggest round tip I could find. They are so delicious! Thanks for sharing! How much is 1 lb in grams ? I just made these, they were good but they came out really hard... I followed the recipe exactly, what did I do wrong? Or are they supposed to be hard on the outside? Just made! Icing was a little sweet for me but I think it balances well with the cake. Bookmarked for future use! Thanks for a great chocolate recipe :) I only baked for about 16-17 minutes since my oven cooks hot.